These can either be inserted into the Online Course trifold brochure, or in the Agape Catholic Ministry brochure. It can also be given out to engaged couples as a standalone piece. 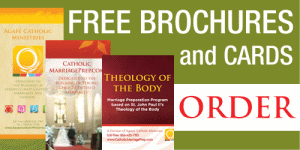 This insert explains how couples -- throughout the online or live pre-cana -- will be learning Saint John Paul II's Theology of the Body concepts. Please enter the quantity of inserts you wish to receive.